Great leaders know how important Task Relevant Maturity is to having a high performing team. It’s the acknowledgement that one-size-fits-all leadership is a recipe for failure. Instead, you need to keep in mind the skills and experience level someone has for specific tasks. 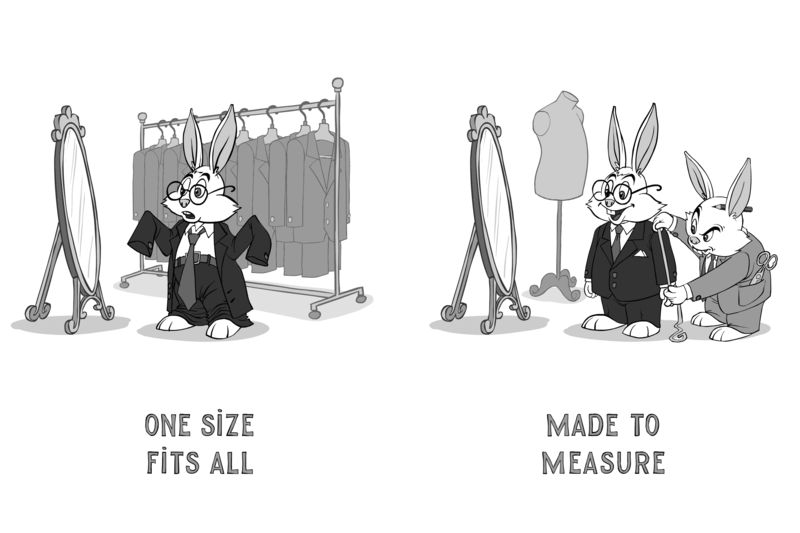 Then, you tailor your management approach to fit them. 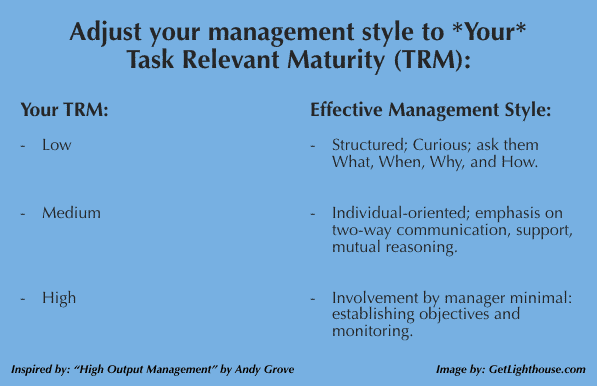 What is Task Relevant Maturity? On the surface, it’s an easy concept, but many managers get it wrong. Most of the time, it happens because they confuse someone’s general experience with a specific task experience. New Tasks: You assume you can be hands off with someone who has a new responsibility like you are with things they’ve done for years. This causes them to make avoidable and costly mistakes. New Roles: You set a great employee up to fail by being hands off when you promote them; this is exactly when they now have low Task Relevant Maturity. Micromanaging: Hiring your first veteran employee to your team and being as hands on as you are with your junior staff will only frustrate them endlessly. If this concept is new to you, I recommend you check out our deep dive on this crucial management concept here. Today, we take a look at the next level of Task Relevant Maturity: Yours. One of the most important skills as a manager is developing your self awareness. It applies to everything from understanding how you affect others, to recognizing your mistakes, to clearly seeing the strengths and weaknesses of your team. It also applies to understanding your skills as a leader. As you advance in your career, you’ll start hiring people to do things you’ve never done. This is true whether you’re a founder with a growing team, or a mid level leader in your organization. Hiring: You have a hard time hiring the right person, because you don’t know the difference between a good and bad hire. Support: Without an understanding of their job, it’s hard to support them effectively so they can succeed. Recognition: You don’t know how to judge the quality of their work, or even recognize their impact on your team. Today, we take a look at how to address these common problems when you lack Task Relevant Maturity. When you don’t know what you don’t know, it can be very hard to act. If you know you need help, but aren’t sure about a role, you’re probably not ready to hire them. The last thing you want to do is hire the wrong person, or hire a great person and set them up to fail. 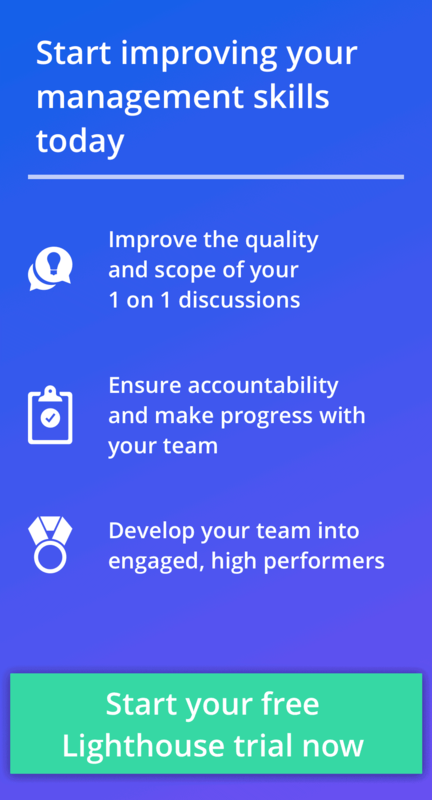 What impact can I expect them to have on the key challenges my team has right now? How do I tell the difference between a good one and a poor one? How do people in this role differ in skillsets? Which kind of <role type> do you think I need for my team? What should I avoid? How do I know they’re doing a good job? Best of all, if the people you ask know you and your company well, they can help you look out for pitfalls you’d never see on your own. Then, after you talk to 5-10 people, you should start to see some patterns. From those patterns, you can put together a job description that captures the role, and specifically what you need. If you share that job description with those you talked to, you can then tune it based on their feedback. Now, you have a great job description and are ready to recruit. Even better, having all these discussions with people who understand the role better than you, you can get their help recruiting. Who better to know the right person for the role than people who have done it or hired for it before? They can also even help you design a good assignment to validate their abilities (our favorite hiring tactic). This approach will help you greatly increase the likelihood of making a good hire. However, once you find someone, your work is just beginning. How do you support them so they succeed? Once you’ve hired someone you’re excited to have on your team, your real work begins. Now, you need to work hard to understand their drivers for success and how you can help them succeed. What are the most important things they’ll need to be successful? How can I tell they’re doing a good job? What do I need to do to support them well? These questions will help build a baseline of activities for you to do as they get started and throughout their time working with you. Equally important is to be direct about all this. Be up front with them about the fact that you’re not as familiar with their role. Your transparency can help build a great foundation of trust at the start, and set the stage for critical conversations you need to have with them. Start by asking the same 4 questions above directly to the person you hired. They are who the questions are for after all, so they should have some ideas. You can then also compare them to what others told you, confirming the advice or adding much needed nuance. For my friends who have stepped into roles where they’re working with leaders who have low Task Relevant Maturity in what they do, a key differentiator for those that succeeded was a plan. Typically, their plans outlined what they planned to do in their first 90 days in detail. To set a vision, they often also shared 1, 2, and even multi-year goals thereafter in less detail. Shared language: You’ll both have to agree on first, high impact steps they can take, and how to define them. Alignment: When they lay out their vision, you can compare it to yours, and work to align them together. Empathy: You can learn a lot about their communication and work styles by seeing whether it’s a bulleted list, slides, report, whiteboard discussion, etc and how they respond to your feedback and suggestions. Now that you have a plan for them to do the right things, and a baseline understanding of what you both need to do for them to succeed, you’re on the right path. The key then is to build on this momentum so you know they’re doing a good job or not, and to continue to support them successfully either way. 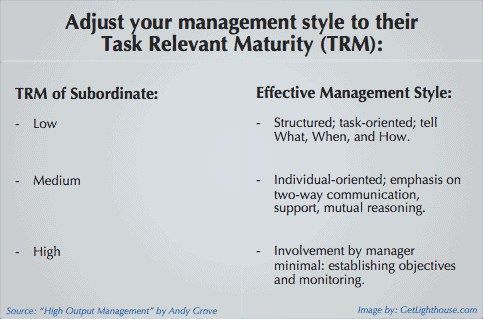 It takes ongoing effort to improve your Task Relevant Maturity when managing someone whose job you’ve never done. Keep a growth mindset and ask good questions, and you’ll be on the right path. 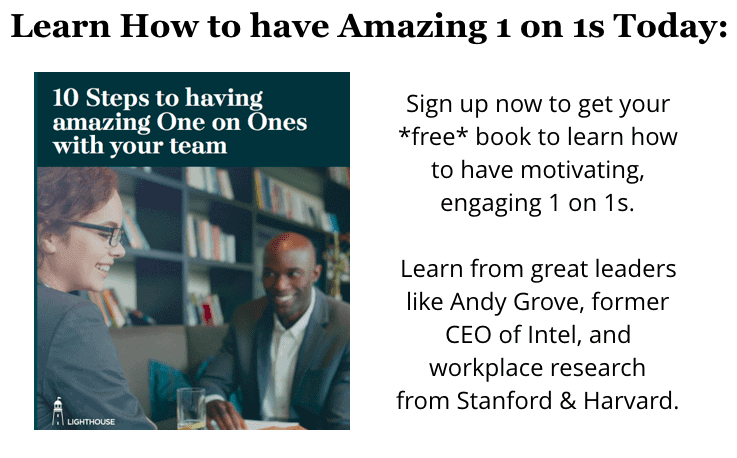 For every new hire, you should start with more frequent 1 on 1s to make sure they’re comfortable, and well supported. This is even more important when you don’t really understand their work. Just like you would be more hands on with someone else with low Task Relevant Maturity, you need to do the same for your own low TRM. The difference is what you do with the extra time you spend with them. Most important, is the first row. Be curious. Take the time to ask your team member to explain things to you. The more they explain especially the Why behind what they’re doing, the faster you’ll raise your understanding. 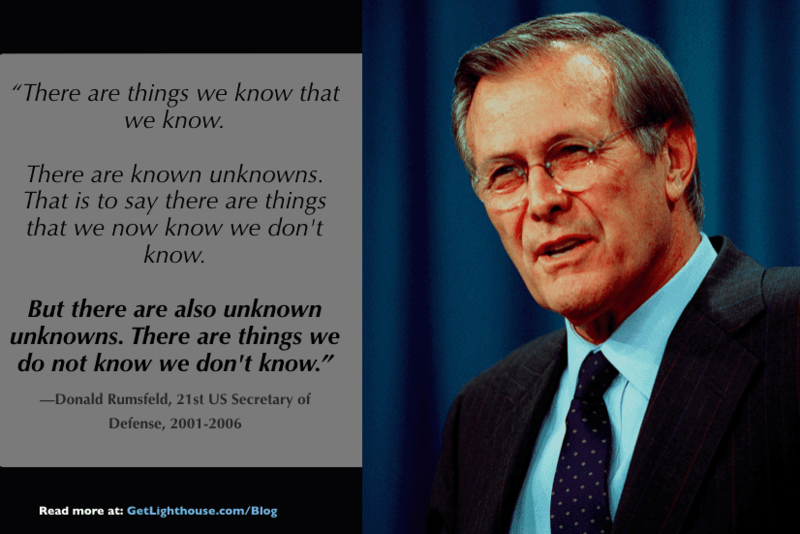 As they lay out their work, their long term plans, and the reasoning that went into it, all those unknown unknowns will start becoming known knowns for you. You’ll also be able to better guide their work, as you better understand what’s easy and hard, and where they’re succeeding and struggling. You absolutely can and should ask many of these questions outside of 1 on 1s. Ask them any time they share work, ideas, or projects with you. However, the beauty of 1 on 1 meetings is the sustained, uninterrupted discussion. It gives you plenty of time to dig in and ask questions. It allows you, the teacher, to become the student for a minute. You can also be more comfortable as you ask questions privately, rather than fearing embarrassment by asking a basic question in front of the whole team or your boss. It happens in every role. When you haven’t done it, it can be hard to recognize quality and effort. If you’ve never been a great writer, it’s hard to judge your content marketer on their writing. If you’ve never been a designer, it’s hard to judge nuances of their design. Or if you’ve never been a PM, you may find yourself wondering what they did that led to a great feature shipping early and above expectations. Of course, you can see the high level progress and results of their work, but it will be harder to give them detailed feedback or appreciate them beyond that. This is why creating the plan is so important. It gives you both a reference point to work off of and adjust over time. Question their abilities because you don’t see how hard something is. Fail to praise them for work they’re really proud of. Ignore them when they come to you with something important to them, but you don’t see the value of. Demand unreasonable results or output, because you don’t understand the time commitment and tradeoffs of their work and many priorities. When you regularly talk to your new team member about their role, the plan, and what the job is really like for them, you develop an empathy and understanding of what they do. You can then be a much better judge of their work, supporter of their efforts, and coach for their priorities. That’s management Task Relevant Maturity in a nutshell. In the end, it all comes down to communication and effort on your part. You will not suddenly wake up one day and understand their job unless you do the work. Unfortunately, too many leaders spread themselves thin and don’t pay the extra attention to these kinds of high risk hires. It’s much easier to be hands off from Day 1 if you know the role well. When you don’t, you absolutely have to make more time to communicate with them. Canceling meetings, ignoring requests for input, and failing to work to understand their role will set you both up for a sad outcome. They’ll get frustrated, and you won’t get what you should out of a critical hire. You may even part ways. Fortunately, it’s pretty easy to build up your Task Relevant Maturity. Much of the work you need to do can be accomplished rapidly by taking the time to ask good questions. Whether you ask friends and mentors to raise your understanding or are asking the employee themselves, they all help level you up as quickly as possible. When you go in well prepared, and with eyes open to the challenges you’ll face, you can make a successful hire, even for roles you’ve never done yourself. 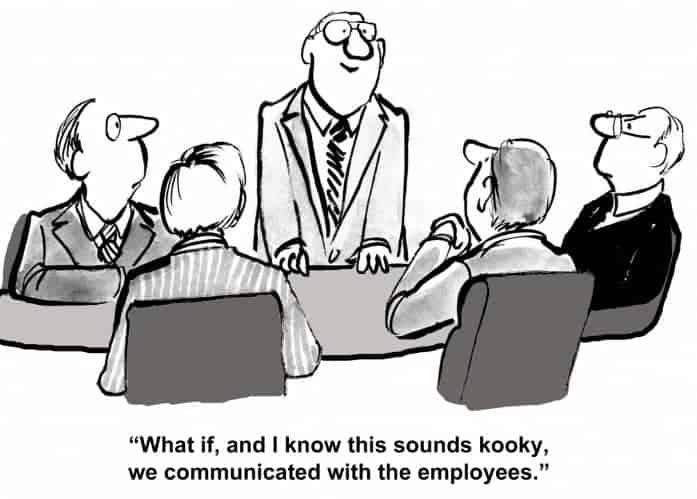 What tactics have you used to hire great people and help them succeed when you’re not well-versed in their role?